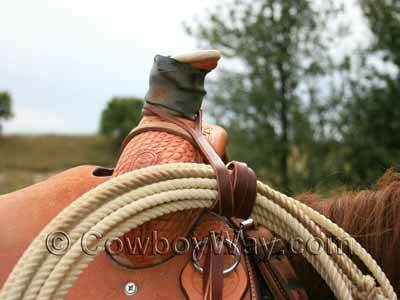 A "rope strap" is an attachment to a saddle that holds a rope when the rider isn't using it. There are numerous different types of rope straps that vary according to personal preference. The simple leather rope strap shown in this article is popular with a wide variety of riders, and is also fast and easy to attach to a saddle. Below: A leather rope strap holding a rope on a saddle. The strap itself is simply a narrow piece of leather with a short slit in one end and a longer slit in the other end. 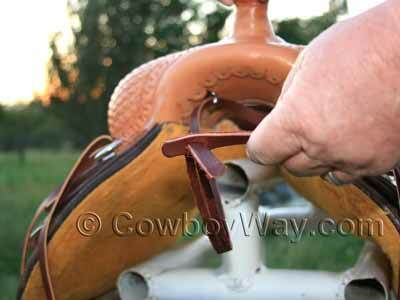 The short slit is for attaching the strap to the saddle, and the longer slit is so that the rider, after wrapping the strap several times around the rope, can spread the slit open and pass it over the saddle horn. A leather rope strap. Leather rope straps come in different thicknesses, widths, and lengths. The one shown in this article is 1/2 of an inch wide, 36 inches long, and is about 1/16 of an inch thick. There's a 1 inch slit in one end, and a 6 inch slit in the other end. The 6 inch slit comes to within about 1 1/2 inches from end of the leather. A strap like this is strong enough to hold a rope, but should break free if the rope it's holding to the saddle should accidentally get hung up. If you look underneath the front of your saddle you will see a series of nails the saddle maker used to help hold down the leather covering the fork. Choose one of the nails as the location for your rope strap, then slide the flathead screwdriver under the piece of leather being held down by that nail and pry the nail loose. 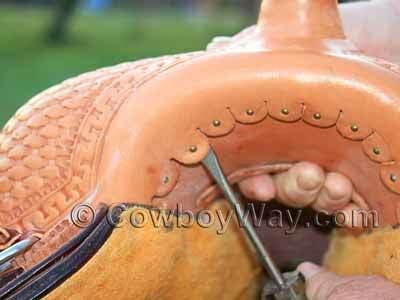 In the photo below the second nail from the bottom on the right-hand side of the saddle is being pried loose. Do you have to attach your rope strap here? No. Please see "Where To Attach A Leather Rope Strap" at the bottom of this page. Using pliers, pull the loosened nail all the way out. Keep the nail. 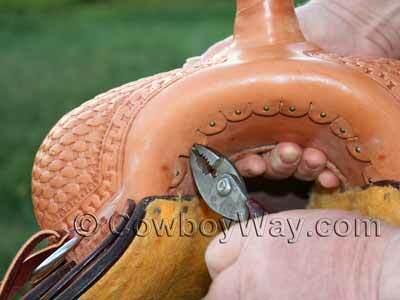 Slide the dee-ring with a clip underneath the piece of leather loosened when the nail was removed. Line up the hole in the clip with the hole in the leather. Using the hammer, pound the nail back through the same hole you pulled it out of. Take the end of the rope strap with the long slit and pass it through the dee-ring. Then take the same end of the rope strap - the one with the long slit - and pass it through the short slit on the other end. Pull on the rope strap until it is gently snug against the dee-ring. Your rope strap is now attached to your saddle. Wrap it around your rope several times, then open the long slit in the end and spread it over your saddle horn to hold your rope when you're not using it. 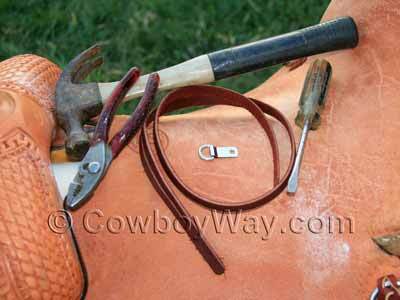 You can attach a leather rope strap to your saddle any place you want. It's common to attach them where shown in the article above, but it's also common to attach them in other locations. 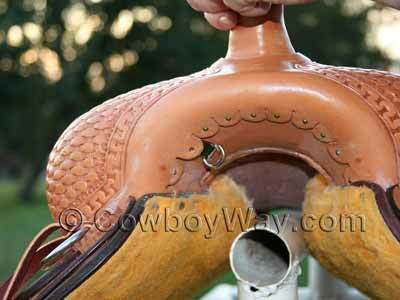 For example, some folks attach them to the fork a couple of inches or so to the side of the saddle horn. Still others attach them in the gullet similar to the location in the photos above, but they use a new nail or screw and put the dee-ring in a new location without loosening an existing nail. 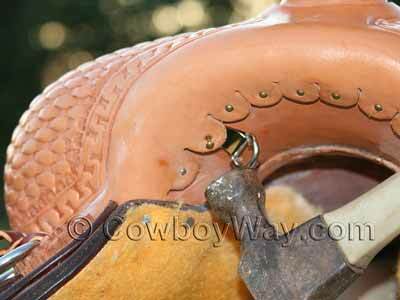 It's really just a cowboy thing: It's your saddle and your rope, so you pick the spot. Not everyone uses a leather rope strap, or the same type of leather rope strap shown above. 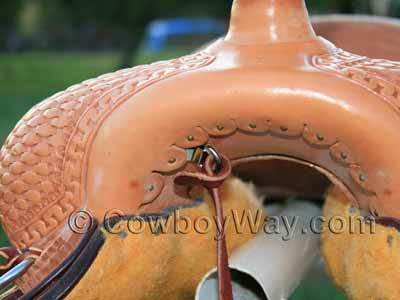 Some riders prefer to use rubber looped over the saddle horn to hold their ropes when they're not using them, and still others prefer to use a type of leather rope strap commonly called an "Oregon crossover." Every type of rope strap has it's advantages and disadvantages, so if you're unsure of what type you'd like on your saddle you may need to keep your eyes open to see what others around you are using and ask a few questions.